Rocky Mountains perch (11,486 ft.): Squaw Mountain Fire Lookout in Colorado is like living in the air—and you get a catwalk, stove, refrigerator, and heat. Expect to hike in a mile from the parking area. Close to Idaho Springs. Wildlife wonderland (10,003 ft.): Chances are favorable for seeing elk, black bears, and cougars from Spruce Mountain Fire Lookout Tower in Medicine Bow National Forest. Close to Laramie, WY. Life of a lookout (almost 10,000 ft.): A historic tower saved from demo in 1991, Jersey Jim Fire Lookout Tower still has its fire finder and 360s of Hesperus and Sleeping Ute mountains of the Four Corners. Near Mancos, CO.
Wild in Wyoming (9,600 ft.): Standing at Sheep Mountain Fire Lookout, you may think, Is that the Bighorn National Forest and Devils Tower National Monument in the distance? Why, yes, it is. Close to Buffalo, WY. Jump in a lake (7,772 ft.): An hour’s drive from the well-cared-for Black Mountain Lookout is Frenchman Lake. You can also flip on lights in this electric cabin. Close to Milford, CA, in ­Plumas National Forest. Triple range views (7,702 ft.): The views are mind-bending—if you hit the weather right at Gird Point Lookout. Close to Hamilton, MT. Scenery seeking adventure (6,521 ft.): The 2.1-mile trail to Washington’s Winchester Mountain Lookout is difficult, with an elevation gain of about 1,300 feet in the Cascade Mountains and ice possible in July. But Mt. Baker is stunning. Overnighters are welcome on a first-come, first- served basis. If bunks are taken, pitch a tent under the stars. Volunteer maintained. Close to Mt. Baker, WA. Summer drive-in (5,980 ft.): The three-story Calpine Fire Lookout in the Sierra Nevada, built in 1934, is one of only three “windmill style” lookouts left in California. On a winter trip, arrival is by snowmobile, snowshoes, or skis; in summer, drive there directly. Close to Truckee, CA. Panoramic frontier (5,780 ft.): Don’t be surprised by a grizzly (or at least evidence of one) in the Kootenai National Forest below Big Creek Baldy Mountain Lookout. Close to Libby, MT. 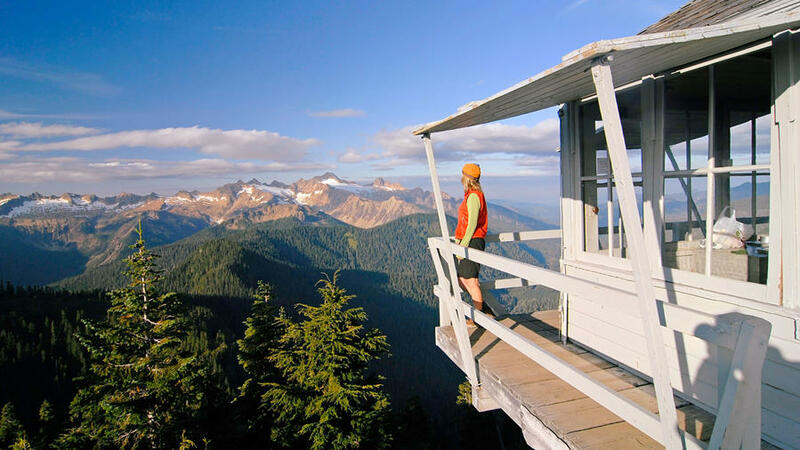 Flashback 1930s (5,587 ft.): There’s a steep hike to Evergreen Mountain Lookout, a 1935 timber fire lookout on the National Register of Historic Places. Hello there, Mt. Rainier. Close to Skykomish, WA. History in Shasta-Trinity range (4,809 ft.): Above the Sacramento River Canyon, Girard Ridge Lookout stands 13 feet off the ground, optimal for those not into climbing stairs. Close to Dunsmuir, CA. Huckleberry heaven (4,755 ft.): From Deer Ridge Lookout’s wraparound catwalk, you can view the Idaho Panhandle National Forests when you’re not out picking huckleberries. Close to Bonners Ferry, ID. Earmark for winter (4,454 ft.): Many towers are summer only. But on the southern slope of Mt. Hood is Clear Lake Cabin Lookout, which welcomes powderhounds who are okay with the 4-mile snowshoe trail in. There’s a pulley system to carry firewood. Near Government Camp, OR. Waterfall access (3,630 ft.): At Bald Knob Lookout, Eden Valley and Rogue River are spread before you, and nearby is the Coquille River Falls trail, leading to a two-tier 45-foot and 65-foot cascade. Near Powers, OR.